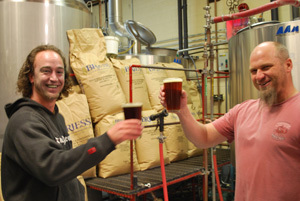 Cody Carter and Jeff Van Horn raise a glass of Moab Brewery beer. 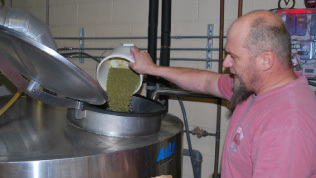 “As a brewer, it’s your job to be a dishwasher and a zookeeper– if you aren’t a good dishwasher and you can’t take care of the yeast– you’re not going to have a lot of success,” said brewer Jeff Van Horn of the Moab Brewing Company. Following Van Horn around his brewery one sees what he is talking about—he runs hot water through lines, while assistant brewer Cody Carter scrubs their 15-barrel mash tun. The zoo- keeping part is less obvious. Jeff points to a mass of spongy brown foam: keeping the yeast healthy produces the best beer. Just like a good zookeeper, Jeff feeds his yeast exactly what they want: water, sugar, and fine malted barley. Their new line-up features “Johnny’s.” It comes in IPA,and features a retro red and blue checkered design. It is very smooth and a great value. Unlike most other microbrews in cans, they decided to go with a 22-ounce tall boy and offer them in four packs rather than six. If the move was primarily to offer a far more environmentally-friendly product, they couldn’t have done a better job. First, aluminum is far more easy and readily recyclable than brown glass bottles. The four-pack also has a holder that is not dangerous to animals or fish. Dolphins can swim freely and seagulls need not worry getting snagged in Moab’s plastic four-pack holders. Van Horn is an amateur turned professional. Starting as a homebrewer, he turned his passion into a full-time vocation. Van Horn is unhappy about the ironic fact that Moab Brewery’s Desert Select line currently sells better in Reno than it does in Utah. “We can’t get a decent placement on the shelves at the liquor stores.” While other Utah high-gravity beers such as Uinta’s Crooked Line and Epic’s beers are on prominent display, Desert Select is found in less prominent locations or not offered at all. According to Van Horn this is due to new regulations that the DABC put in place not allowing more beers from one single brewery to maintain consistent distribution, but instead “provisional distribution” in state-run stores, which means that each liquor store now has the ability to determine which beers have prominent placement and which do not. Brewer Kevin Crompton at Epic said his reps are constantly visiting individual liquor stores. These reps are always checking if their product is low or not well placed. Also, Epic was fortunate enough to get their beers in regular distribution before the “provisional” category was introduced. “It’s clear Epic changed the game for everyone.” Van Horn regrets that liquor stores can’t be operated more like some of the excellent ma-and-pa liquor stores that are found in Colorado. “Each one of these shops has it’s own character and personality…I know where to find the best selection of craft beer in Grand Junction because there are a few shops that just focus on craft beer.” The DABC has yet to offer a large space dedicated to the huge variety of Utah craft beers. “They complain about not making enough money from these stores. That’s because they aren’t operated like an individual would ever operate an effective business.” The DABC proposed closing down many liquor stores in Utah because of profitability issues. “If they would examine profitable liquor stores around the country they could figure out that it’s not rocket science to make liquor stores profitable. Still, Jeff wishes that the state would adopt another model.